Leverage broad community partnerships with hospitals, providers, payers, and government agencies to expand a community-wide care coordination system, which will increase appropriate referrals for cancer screenings, decrease unnecessary specialist visits and (with telemedicine) increase access to care for patients with diabetes. Focus on achieving improvements for diabetic patients by electronically linking isolated systems and practices for care management, medication therapy management and patient education. Eastern Maine Healthcare Systems, Brewer Maine – $12,749,740. Expand community connectivity, including long-term care, primary care and specialist providers, to existing Health Information Exchange and promote the use of telemedicine and patient self-management in order to improve care for elderly patients and individuals needing long-term or home care. Enhance care for patients with pulmonary disease and congestive heart failure by creating a community-wide medical home, promoting Health Information Exchange and extending Geisinger’s proven model for practice redesign to independent healthcare organizations throughout region. Improve Diabetes management performance measures by increasing availability, accuracy and transparency of quality reporting, leverage Intermountain Healthcare’s strategies to reduce health systems costs throughout the region, and improve public health reporting. Expand the country’s largest Health Information Exchange to new community providers in order to improve cholesterol and blood sugar control for diabetic patients and reduce preventable re-admissions through telemonitoring of high risk chronic disease patients after hospital discharge. Focus on increasing preventive services for diabetic patients in rural areas by extending Health Information Exchange and establishing anchor institutions in close proximity to remote clinics that will promulgate successes in health IT supported care coordination. Reduce racial health disparities and improve control of diabetes and smoking cessation rates by linking technically isolated health systems, providers, and hospitals; and empower patients by increasing their access to Personal Health Records. Enhance patient management and, reduce costs associated with hospitalization and emergency services for patients with diabetes and childhood asthma and address reduce health disparities for underserved populations and rural communities. Enable robust collection of clinical data from health systems, providers, and hospitals in order to inform practice redesign to improve blood pressure control in patients with diabetes and hypertension, increase smoking cessation counseling, and reduce unnecessary emergency department utilization and hospital re-admissions. Improve care coordination for patients with diabetes, heart disease, hypertension, and asthma by engaging patients and providers in bidirectional data sharing through a Health Record Bank, empowering patients and family members to participate in self-management through patient portals, and expanding access to care managers to facilitate post-discharge planning. Expand pre-hospital emergency field care and electronic information transmission to improve outcomes for cardiovascular and cerebrovascular disease, empower patients to engage in their own health management through web portal and cellular telephone technology, and improve continuity of care for veterans and military personnel through the Veterans Affairs/Department of Defense Virtual Lifetime Electronic Record initiative. Implement a region-wide Health Information Exchange and Patient Health Record solution and utilize secure, internet-based care coordination and tele-monitoring tools to increase access to specialty care for patients with chronic diseases such as diabetes, hypertension, and obesity in this rural, health-professional shortage area . Utilize clinical decision support tools such as registries and point-of-care alerts and reminders and innovative telemedicine solutions to improve primary and specialty care for diabetic patients, decrease preventable emergency room visits, hospitalizations and re-admissions for patients with diabetes and congestive heart failure or pneumonia, and improve immunization rates among diabetic patients. The Massachusetts Health IT Draft Plan was released for public comment in January 2010 and the commenting period is now closed. The plan outlines high-level statewide goals and strategies for achieving improved health outcomes and reduced costs through the use of interoperable EHR systems and health information exchange (HIE). The document sets up governance structures and policy priorities for the planning for use and implementation of federal HI-TECH funds. Currently MA has been awarded ~$25mil, $14mil to MeHI for regional extension centers (RECs) and $10mil to MeHI for HIE. After the MA HIT Plan is adopted, the HIT Council is responsible for the governance structure and MeHI is the Project Management Office (PMO). The HIT Plan was created in response to a number of MA statutes, including Chapter 305, MA 201 CMR 17:00, and Executive Order 504. The original plan was publicly announced in Jan 2009, but withdrawn due to the announcement of the HITECH Act portion of ARRA. The HIT Council and MeHI contracted Deloitte to update the plan to correspond with the HITECH Act and Meaningful Use regulations. The tentative milestones lay out an aggressive plan in line with federal meaningful use requirements. Submit the HIE operational plan including sustainability, privacy and security, etc. Health care is the largest employer in Mass, employing ~450k workers with $29bil in revenue in 2005. Goal 2: Demonstrably improve the quality and safety of health care across all providers through HIT that enables better coordinated care, provides useful evidence-based decision support applications, and can report out data elements to support quality measurement. Goal 3: Slow the growth of health care spending through efficiencies realized from the use of HIT. Goal 4: Improve te health and wellness of the Commonwealth’s population through public health programs, research, and quality improvement efforts enabled through efficient, reliable and secure health information exchange processes. Development of training programs using federal dollars focusing on implementation, project management, practice management, and data management. Programs will intentionally seek out unemployed persons. BioInnovations is a premier gathering of nearly 300 healthcare pioneers from a broad range of industries; from bio-pharma and medical devices to healthcare providers and non-profits. 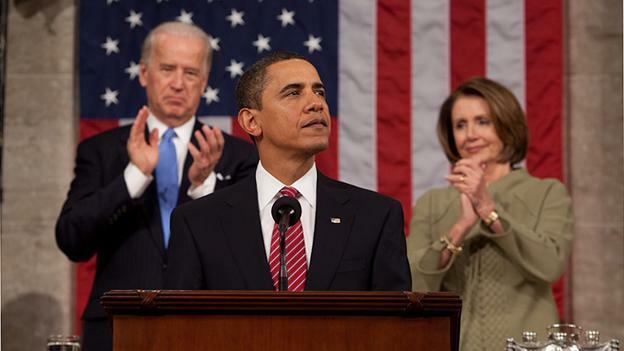 President Obama delivered his first State of the Union Address last night. The Presidential blog at www.whitehouse.gov/blog has an excellent summary of all the initiatives Obama announced and the entire 90 minute video. The full script is also available at http://www.whitehouse.gov/the-press-office/remarks-president-state-union-address. 3-year federal budget freeze – Beginning in 2011, Obama has called for a 3-year federal budget freeze that applies to everything but defense, Medicare/Medicaid, and Social Security. He claimed that without true health reform, it would be impossible to freeze spending on health. And what the American people hope -– what they deserve -– is for all of us, Democrats and Republicans, to work through our differences; to overcome the numbing weight of our politics. For while the people who sent us here have different backgrounds, different stories, different beliefs, the anxieties they face are the same. It’s because of this spirit -– this great decency and great strength -– that I have never been more hopeful about America’s future than I am tonight. Despite our hardships, our union is strong. We do not give up. We do not quit. We do not allow fear or division to break our spirit. In this new decade, it’s time the American people get a government that matches their decency; that embodies their strength. To recover the rest, I’ve proposed a fee on the biggest banks. Now, I know Wall Street isn’t keen on this idea. But if these firms can afford to hand out big bonuses again, they can afford a modest fee to pay back the taxpayers who rescued them in their time of need. Now, let’s clear a few things up. I didn’t choose to tackle this issue to get some legislative victory under my belt. And by now it should be fairly obvious that I didn’t take on health care because it was good politics. I took on health care because of the stories I’ve heard from Americans with preexisting conditions whose lives depend on getting coverage; patients who’ve been denied coverage; families –- even those with insurance -– who are just one illness away from financial ruin. After nearly a century of trying — Democratic administrations, Republican administrations — we are closer than ever to bringing more security to the lives of so many Americans…Here’s what I ask Congress, though: Don’t walk away from reform. Not now. Not when we are so close. Let us find a way to come together and finish the job for the American people. Let’s get it done. for the first time in history –- my administration posts on our White House visitors online. That’s why we’ve excluded lobbyists from policymaking jobs, or seats on federal boards and commissions.But we can’t stop there. It’s time to require lobbyists to disclose each contact they make on behalf of a client with my administration or with Congress. It’s time to put strict limits on the contributions that lobbyists give to candidates for federal office. With all due deference to separation of powers, last week the Supreme Court reversed a century of law that I believe will open the floodgates for special interests –- including foreign corporations –- to spend without limit in our elections. I don’t think American elections should be bankrolled by America’s most powerful interests, or worse, by foreign entities. They should be decided by the American people. And I’d urge Democrats and Republicans to pass a bill that helps to correct some of these problems. In the end, it’s our ideals, our values that built America — values that allowed us to forge a nation made up of immigrants from every corner of the globe; values that drive our citizens still. Every day, Americans meet their responsibilities to their families and their employers. Time and again, they lend a hand to their neighbors and give back to their country. They take pride in their labor, and are generous in spirit. These aren’t Republican values or Democratic values that they’re living by; business values or labor values. They’re American values. 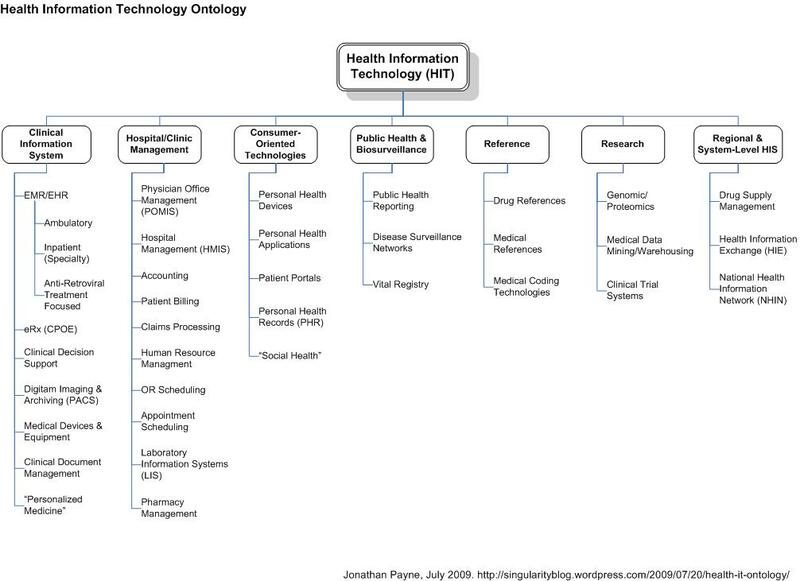 2 weeks ago I solicited help to put together this Health IT Ontology (see Components of HIT…a start). This post is the result of 6 rounds of edits. The new name, I think, better represents the goal of defining all the entities and relationships within the domain of health IT. Click on the image below to see it full size. The initial motivation behind this was to determine where ART-focused EMRs sat in the scope of HIT, but what I expected to be a trivial exercise quickly became a difficult task. Health IT is an extremely complex and expansive domain and every item in this heirarchy could be broken down into even smaller pieces (similar to EMR/EHR). My goal for this diagram was to cover the breadth of health IT more than the depth. It is certainly possible that there are some oversights, in which case I would love to hear from you. I welcome your thoughts, criticisms, and suggestions on the HIT Onthology. Using social media (esp. Twitter and Aardvark) was so successful this time around that I plan to pursue more online collaborative projects in the future. Many thanks to everyone who contributed, and a special shout out to Jacob Sattelmair, Janette Heung, blog commenters, Richard Thall and Eddie from Aardvark, and the score of Twitterers who provided very valuable feedback! HIT could simply be defined as any information technology utilized within the healthcare industry vertical, but that would be too inclusive, because that means a MySQL database is considered HIT because it is sometimes used in a hospital. Brailer & Thompson, former ONC Secretary and former HHS Secretary respectively, define it as “the application of information processing involving both computer hardware and software that deals with the storage, retrieval, sharing, and use of health care information, data, and knowledge for communication and decision making” (Thompson & Braile, 2004). The line between HIT and health informatics is fuzzy and we’ll ignore it for now. Clinical Trial Recruitment, Management, etc. A special thanks to the Twitterers that have already helped me on this: @chadosgood, @oneofthefreds, @ChristineKraft, @ePatientDave, @MedC2, and my good friend Jake. And a shout out to Sam Adam’s HIT Primer on his blog, IT (R)EVOLUTION, that helped get me started. Follow me on Twitter @paynejd to receive links to SlideShare during the conference. I will post a summary when the conference is complete. In addition, there will be several panels in the afternoon.